Myanmar, sitting on the border between South and Southeast Asia, reflects a historically oppressive state with internal struggle as surrounding countries compete for influence. In 1990, the government promised multi-party elections only to ignore the results and imprison advocates for democracy, including Aung San Suu Kyi, the face of Myanmar’s democratic movement. Afterwards, the United States adopted economic sanctions and restricted ties with the country. Recently, leaders in Myanmar have reached out to the United States for the first time in decades. With policy towards Myanmar* at a crossroads, how can the United States pursue its own interests while influencing Myanmar’s slow transition to political and economic change? As Myanmar begins to reach out to the United States diplomatically, how can the United States evolve its previous policy to reflect its national interest while influencing Myanmar’s slow transition towards political and economic change? The US has maintained economic sanctions against Myanmar since 1990, but recently reevaluated its approach. In 2009, the US initiated a strategy of “practical engagement,” using both pressure and engagement to establish better relations with Myanmar as it starts to engage with the US. In this paper I examine past, present, and future US policy towards Myanmar. First, I provide an account of the country’s oppressive history, as Burma became modernday Myanmar. Second, I analyze Myanmar’s current internal and external challenges and evaluate the strategic national interests of the US, China, India, and the Association of Southeast Asian Nations (ASEAN) in regards to Myanmar. I incorporate a multi-level strategy for the Obama Administration, where China’s regional influence affects US policy towards Southeast Asia. In addition, I include Harvard International Affairs Professor Stephen Walt’s balance of threat theory, where states align against a common threat, to demonstrate how the US and Southeast Asia are beginning to balance against the strongest state in the region, China.5 Third, I present arguments for and against engagement and show how some critics assert that new diplomatic initiatives with Myanmar are premature. When the State Law and Order Restoration Council (SLORC) gained power after Ne Win’s resignation in late 1988, the government promised to hold “free and fair multi-party general elections.”12 Aung San Suu Kyi, daughter of revolutionary Aung San, ran for office and became the face of Burma’s democratic movement. In September 1988, the democratic activists of her National League for Democracy (NLD) party were detained as the SLORC declared martial law. Suu Kyi would be placed under house arrest for 15 of the next 21 years, while her party won 80 percent of the seats in the 1990 election.13 The government ignored the results, and it took from 1993 until 2007 to draft the constitution that SLORC, which became the State Peace and Development Council (SPDC), promised before the elections.14 The US implemented economic sanctions in 1990 and cut ties with Burma. The 2003 “Burmese Freedom and Democracy Act” banned imports from Myanmar to the US, and the legislation was expanded in 2008 to include jewelry from other countries made with Myanmar’s resources.15 In 2010, Thein Sein was elected president in the first elections since 1990, showing a partial move towards greater civilian government.16 Suu Kyi was still under house arrest, and her NLD party boycotted the vote.17 Suu Kyi was released following the election and continued to advocate for democracy within her country and to the international community. Once a source of hope for Southeast Asia following World War II, the historically poorly managed country of Myanmar remains a source of trade and resources. However, internal problems become problems for its neighbors, and the international community cannot decide whether to maintain sanctions or engage Myanmar diplomatically and economically. China and India compete for influence, while ASEAN countries pressure the Myanmar government for political change. Meanwhile, the US has begun to try and take advantage of a possible opening in political freedoms to diplomatically engage Myanmar with the international community. Incentives to pursue a new strategy emerged after neither engagement or sanctions alone led to Myanmar’s political reform. Greater diplomacy follows President Obama’s stance of “practical engagement” around the world. Stanford political scientist Larry Diamond suggests that because of the “logic of linkage and leverage, it is not surprising that sanctions do not bring about democratic reform.” 47 Although sanctions may have worked with western-linked countries, they have not in countries like Cuba, North Korea, Zimbabwe, and Myanmar. In the Western hemisphere, while there are differences between the two cases, Chile offers an example of a US policy of sanctions, then sanctions plus engagement, to achieve political reform. In order to change the behavior of Chile and Pinochet’s human rights abuses during the 1970s and 1980s, Congress imposed sanctions on military, economic, and multilateral aid.51 The US used pressure through sanctions and, in the late 1980s, it used engagement with the democratic opposition. The democratic opposition against the Pinochet regime used US and international support to help defeat Pinochet in the plebiscite election in 1988, easing the transition to a democratically elected president in 1990.52 The US would not directly fund Myanmar’s democratic opposition, but engagement gives democratic parties a better environment to participate in government. In the current era of globalization and greater flow of information, the international community and people of Myanmar can force more accountability on the government. This change will most likely happen more slowly than Indonesia’s change between 1980 and 2000. Mancur Olsen outlined a theory about transition from dictatorship to democracy in the American Political Science Review, which states, “if no one leader can subdue the others, […], then the alternative is either to engage in fruitless fighting or to work out a truce with mutual toleration.” 55 As the nominally civilian government in Myanmar has begun to show, the pressure of political reform can lead to power sharing and an opportunity for a transition to democracy. In Perception and Misperception in International Politics, Robert Jervis states, “while sticks as well as carrots are to be employed, the other’s friendship cannot be won by gratuitous concessions.”58 The US should offer sticks to deter Myanmar from taking hostile actions and offer incentivebased carrots to reward Myanmar’s progress in key areas including human rights, democratic reform, and support for the rule of law. If Myanmar’s government meets clearly stated goals, the US can slowly lift economic sanctions to cultivate political and economic reform, improved human rights, and more personal freedoms. The US, through a clear policy of engagement and accountability, and Myanmar, through transparency and reform, can and must develop mutual credibility, with the ultimate goal of paving a path where the US, working with the European Union, Australia, and Japan, can permanently lift sanctions.63 This can only occur once it is certain that Myanmar’s leaders are embracing reform with institutional safeguards in place so future crises do not return the state to past trends. The Obama Administration is trying to shift American interests away from the Middle East and towards the Pacific. Secretary Clinton made progress in her November 2011 visit to the country after President Obama announced a “larger and long-term role in shaping this region and its future.”68 Clinton met with the leader of Myanmar’s democratic movement, Daw Aung San Suu Kyi, and made progress to create a mutually beneficial partnership with Myanmar and its allies in the Pacific. The US government’s approach of “pragmatic engagement” can offer the slow transition to political reform that is needed in Myanmar. Rieffel, Alexis. Myanmar/Burma: Inside Challenges, Outside Interests. Washington, D.C.: Brookings Institution, 2010. xxiii. Print. “President Obama’s Speech To The Australian Parliament – 17 November 2011 – Transcript Text – (TCP)CHICAGO.” The Critical-Post Mid-West Coast E-zine. 17 Nov. 2011. Web. 03 Dec. 2011. .
Olarn, Kocha. “British Prime Minister Cameron to Visit Myanmar - CNN.com.” CNN. Cable News Network, 01 Jan. 1970. Web. 26 June 2012. .
Lindley, Dan. “Lindley: Models and Course Concepts for IR/FP Courses.” University of Notre Dame. 03 Dec. 2011. Web. 07 Dec. 2011. .
Kerry, John. “US Senate Committee on Foreign Relations: Press Room - Chairman’s Press.” US Senate Committee on Foreign Relations: Home. 29 June 2011. Web. 01 Dec. 2011. .
Rieffel, Alexis. Myanmar/Burma: Inside Challenges, Outside Interests. Washington, D.C.: Brookings Institution, 2010. xiii. Print. Aung San Suu Kyi, Daw. The Voice of Hope: Aung San Suu Kyi Conversations with Alan Clements. New York, NY: Seven Stories, 2008. 309-10. Print. Rieffel, Alexis. Myanmar/Burma: Inside Challenges, Outside Interests. Washington, D.C.: Brookings Institution, 2010. 5. Print. “BBC News - Burma Country Profile.” BBC News - Home. 12 Oct. 2011. Web. 02 Dec. 2011. .
Charney, Michael W. A History of Modern Burma. Cambridge, UK: Cambridge UP, 2009. 4. Print. Rieffel, Alexis. Myanmar/Burma: Inside Challenges, Outside Interests. Washington, D.C.: Brookings Institution, 2010. 7. Print. “Senate Panel Votes to Renew Myanmar Sanctions.” Reuters, 18 July 2012. Web. 30 July 2012. .
ISA Region Report East Asia and Pacific. Rep. International Strategic Analysis, June 2011. Print. Harvey, Rachel. “Burma Poll: Aung San Suu Kyi’s NLD Sweeps By-elections.” BBC News. BBC, 04 Feb. 2012. Web. 26 June 2012. .
“Suu Kyi’s Party Claims Landslide Win in Myanmar Vote.” Reuters. NBCNews, 2 Apr. 2012. Web. 30 July 2012. .
“CQ.” Statements on Introduced Bills and Joint Resolutions. United States Senate, 12 June 2012. Web. 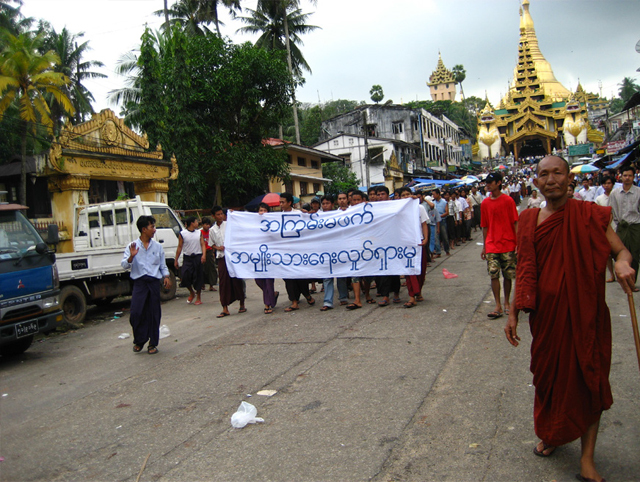 30 July 2012. .
“Setting the Record Straight.” U.S. Campaign for Burma. N.p., 16 May 2012. Web. 30 July 2012. .
Green, Michael. “Asia’s Forgotten Crisis: A New Approach to Burma.” Foreign Affairs 86.6 (November 2007). Print. Campbell, Kurt M. “U.S. Policy Toward Burma.” U.S. Department of State. 21 Oct. 2009. Web. 01 Dec. 2011. .
DiMaggio, Suzanne. “Clinton Visit Presents Opportunity in Myanmar - CNN.com.” CNN. com - Breaking News, U.S., World, Weather, Entertainment & Video News. 30 Nov. 2011. Web. 01 Dec. 2011. .
Richter, Paul, and Mark Magnier. 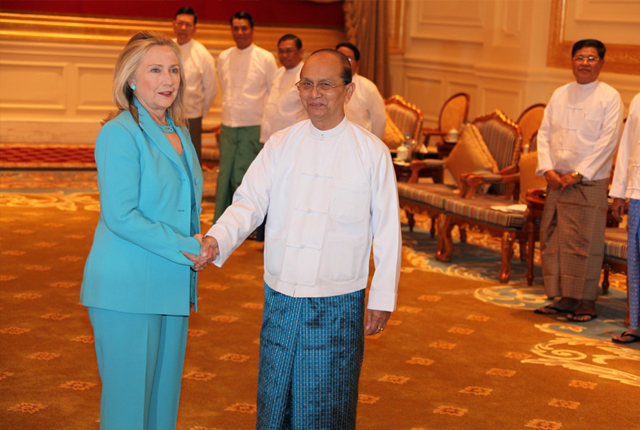 “Hillary Clinton’s Myanmar Trip Marks Significant Shift in Policy - Latimes. com.” Los Angeles Times - California, National and World News - Latimes.com. 30 Nov. 2011. Web. 02 Dec. 2011. .
Rieffel, Alexis. Myanmar/Burma: Inside Challenges, Outside Interests. Washington, D.C.: Brookings Institution, 2010. 13-14. Print. Mitchell, Derek. “Asia’s Forgotten Crisis: A New Approach to Burma.” Foreign Affairs 86.6 (November 2007). Print. Rieffel, Alexis. Myanmar/Burma: Inside Challenges, Outside Interests. Washington, D.C.: Brookings Institution, 2010. 14. Print. Rieffel, Alexis. Myanmar/Burma: Inside Challenges, Outside Interests. Washington, D.C.: Brookings Institution, 2010. 115. Print. Diamond, Larry Jay. The Spirit of Democracy: The Struggle to Build Free Societies throughout the World. New York: Times /Henry Holt and, 2008. Print. Rieffel, Alexis. Myanmar/Burma: Inside Challenges, Outside Interests. Washington, D.C.: Brookings Institution, 2010. Print. Arendshorst, John. “TheDilemma of Non-Interference: Myanmar, Human Rights, and the ASEAN Charter.” TheDilemma of Non-Interference: Myanmar, Human Rights, and the ASEAN Charter. Northwestern University, 2009. Web. 30 July 2012. .
Yoshimatsu, Hidetaka. “Collective action problems and regional integration in ASEAN.” Contemporary Southeast Asia 28.1 (2006) : 115-141. Rieffel, Alexis. Myanmar/Burma: Inside Challenges, Outside Interests. Washington, D.C.: Brookings Institution, 2010. 160. Print. Rieffel, Alexis. Myanmar/Burma: Inside Challenges, Outside Interests. Washington, D.C.: Brookings Institution, 2010. 106. Print. Martinez, Renee Russo., and Leong Wen. Shan. Chile. Milwaukee, WI: Gareth Stevens Pub., 2003. Google Books. 2003. Web. 6 Dec. 2011. Ortega, Alejandro. “International Effects of the Democratic Onset in Chile.” Stanford Journal of International Relations. Stanford University, 2010. Web. 6 Dec. 2011. .
Allchin, Joseph. The Independent. Independent Digital News and Media, 20 Sept. 2011. Web. 03 July 2012. .
Olson, Mancur. “Dictatorship, Development, and Diplomacy.” The American Political Science Review 87.3 (September 1993): 567-76. Print. Walt, Stephen M. “What’s the United States Up To in Asia? | Stephen M. Walt.” FOREIGN POLICY. 18 Nov. 2011. Web. 07 Dec. 2011. Kurlantzick, Joshua. “Policy Innovation Memorandum No. 11.” Conditional Normalization with Myanmar. Council on Foreign Relations, 30 Nov. 2011. Web. 6 Dec. 2011. .
Jervis, Robert. Perception and Misperception in International Politics (Princeton, NJ: Princeton University Press, 1976). pp. 58-84. Martin, Michael F. “Burma’s April Parliamentary By-Elections.” Congressional Research Service. N.p., 4 Apr. 2012. Web. 5 July 2012. .
DiMaggio, Suzanne. “Clinton Visit Presents Opportunity in Myanmar - CNN.com.” CNN.com - Breaking News, U.S., World, Weather, Entertainment & Video News. 30 Nov. 2011. Web. 01 Dec. 2011. .
“President Obama’s Speech To The Australian Parliament – 17 November 2011 – Transcript Text – (TCP)CHICAGO.” The Critical-Post Mid-West Coast E-zine. 17 Nov. 2011. Web. 03 Dec. 2011.